Winter is finally coming this April, marking the start of the last season of GoT. Last week, we saw the first ever look of Game of Thrones season 8 in a tiny HBO teaser. Now, the full fledged teaser for the show has released, revealing that the saga will return to streaming screens around you on April 14. Yes, Game of Thrones will be back for its last and final season on April 14. That is exactly 90 days from now. The new season of GoT will be 6 episodes long, but all the episodes are expected to be feature length, hence a big dose of GoT is headed your way. 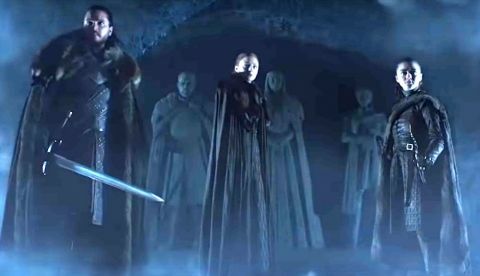 The new 1 minute 44 second teaser of GoT season 8 sees the Starks - Sansa (Sophie Turner), Jon Snow (Kit Harrington) and Arya (Maisie Williams), walk the Crypts of Winterfell. As the trio walk the narrow, chilly and dark corridors of the crypt, voices emerge from the statues of Catelyn Stark, Eddard Stark, and Lyanna Stark (Jon Snow’s real mother and Rhaegar Targaryen’s wife). Lyanna’s statue is the first to appear and throws back to the very first episode in the series where King Robert Baratheon is seen placing a feather in the statue’s hand. "You have to protect him," the flashback dialogue can be heard from when Lyanna asks Ned Stark to protect and adopt baby Jon. Each of the statues repeat dialogues from the years gone by and speak to the three Starks, not literally, but in a sort of deep, soulful manner, almost like voices in their heads. The three then stop in front of their own statues in the Crypt as a white chill starts to emerge towards them. Winter has finally reached Winterfell and possibly the White Walkers.